Today was a pretty average day. The happenings are below, but today..some pictures! 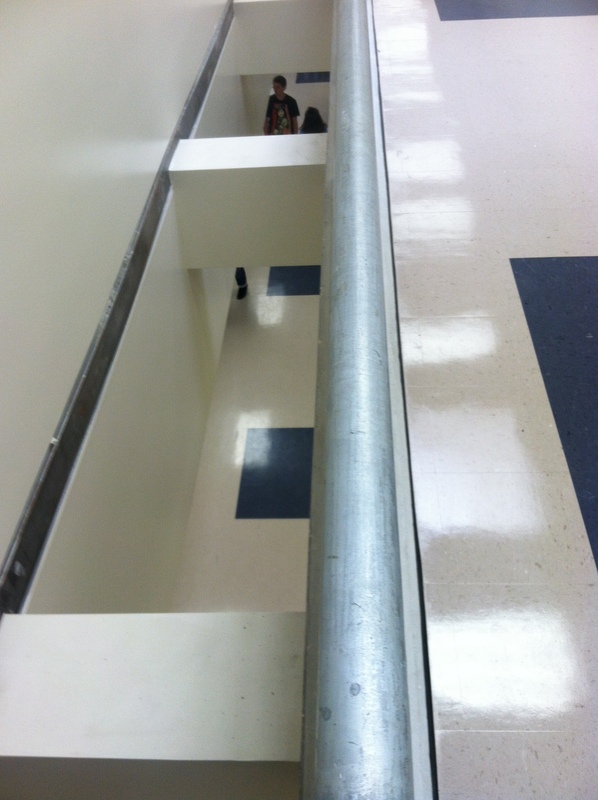 It’s exactly wide enough that a student could fall through it, should they climb over the railing. Or get thrown down it. Or have any number of other things thrown through it. Not that teenagers would ever think of doing such a thing, of course! The railing surrounding the hole is in the background. 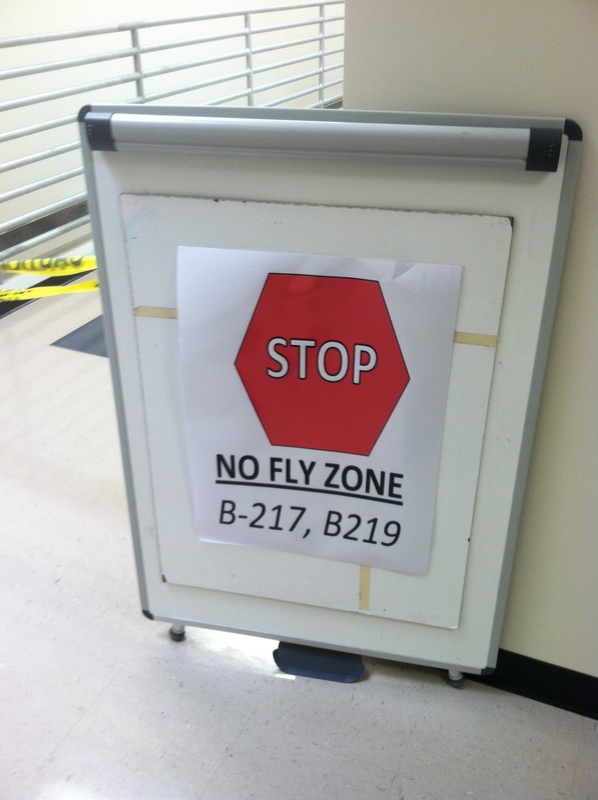 To be fair, so far…they’ve generally obeyed the No Fly Zone. This is right outside my classroom. I think the hole is a neat architectural twist. I agree with one of my seniors, though: this is more of a college-type design and not a good idea around teens. The students are already violating the No Fly Zone, but no one has gone over the railing. Yet. The kiddos got to figure out that the (x, y) coordinates on the Unit Circle correspond to the (cosine, sine) of the triangles that make it. Today was reading the Unit Circle for information, then getting the other 4 trig functions too. 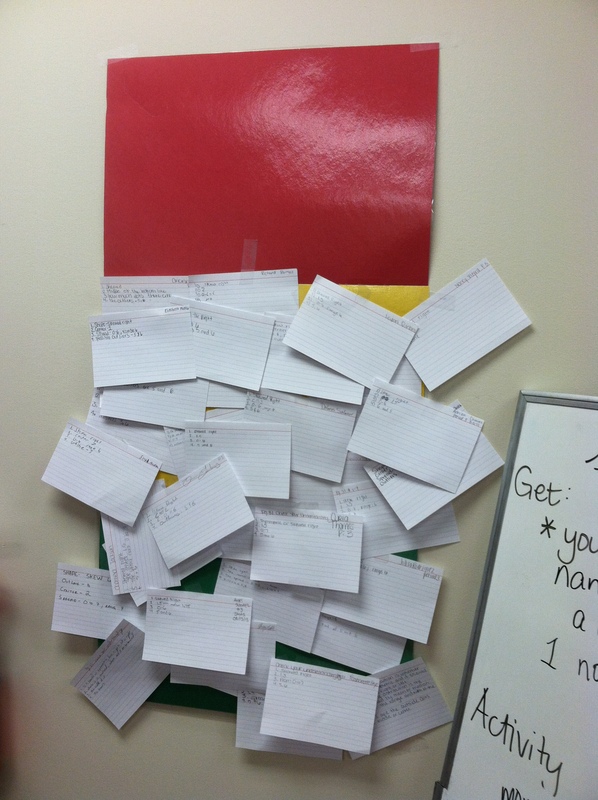 The kiddos finished reviewing the Pythagorean Theorem. The beginning of histograms with Activity-Based Statistics’ “A Living Histogram” paired one of the Rossman-Chance applets that changes the intervals. The students are more comfortable with the TI84s and successfully ran a simulation of 100 games involving a 75% free-throw shooter who shoots eight free throws a game. Back to watch the much-smaller children dance to Fireball. They’re pretty cute. The song is pretty annoying. ← Day 7 of 180: The students get a day off. Kind of.